It's hard to believe that the world's first mountain-top observatory - built in 1888 - would still be working and providing scientists with valuable information. After more than a century of service, the Lick Observatory is still first and foremost a scientific research institution, run by the University of California at Santa Cruz. Visitors are welcome, and the mountain-top location is a great destination for a day trip from the Silicon Valley. At the Lick Observatory, you can go inside the original dome to hear about its history and technological achievements. It's a short walk to the nearby Shane reflector telescope, where exhibits will explain why it's one of the major telescopes used to discover planets outside our solar system. 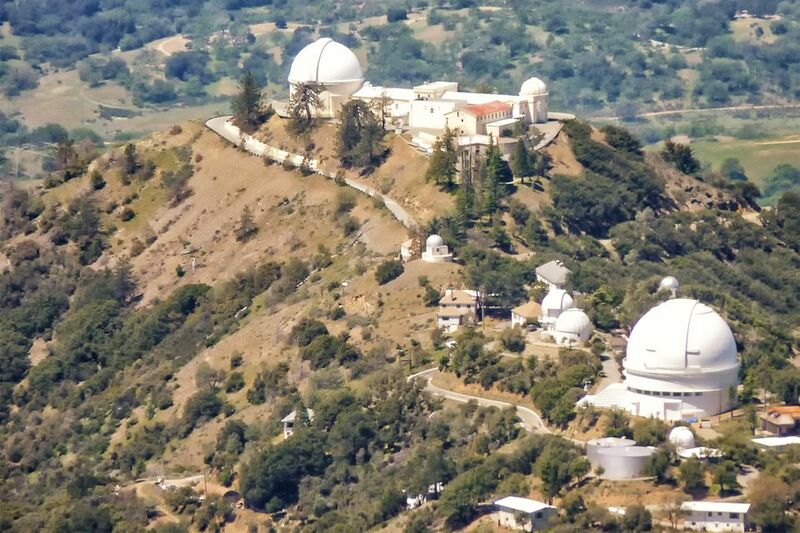 The most fun way to see the Lick Observatory is to participate in their Summer Visitors Program when you can visit in the evening and get a rare chance to look through the telescopes. It's so popular that they sell out every year - and they advise against bringing children under 8. Their Music of the Spheres concert series is also held in summer. Sign up for their mailing list to get information for the current season. Take the free tours given every half hour to understand the importance and accomplishments of the Lick Observatory. Children may find this place boring - unless they're little wannabe astronomers. The Lick Observatory is at 4,200 feet elevation, and it will be colder up there than wherever you started from. Take an extra layer of clothing. Fill your tank before you start up the mountain - there's no gas station up there. You'll find a gift shop, vending machines, and restrooms, but no place to eat. Don't try to go to the Lick Observatory at night - there's nothing to see, and your automobile lights can disturb the scientists' observations. The road going up the mountain is nausea-inducing for anyone who suffers from motion sickness. Bring your favorite remedy. For wheelchair access to the 120-inch dome, call 408-274-5061 before you go. Today, you might not be surprised to find a cutting-edge piece of scientific gear near San Jose in the Silicon Valley, but it was a different story in the late 1880s. Millionaire and San Jose resident James Lick, who made his fortunes in real estate during the California gold rush suffered a stroke at age 77. After(it is said) he cut his only son out of his will for neglecting hi pet parrot, Lick was looking for a way to make good use of his remaining fortune. Lick let his friend George Davidson persuade him to abandon plans to build a pyramid in his honor, and instead to fund development of the world's most advanced astronomical telescope. Finished in 1888, 11 years after Lick's death, Lick Observatory's 36-inch refractor telescope (made with a glass lens to focus the light) was the largest of its type ever built. By the time the Shane 120-inch telescope was completed nearby, the design had switched to using mirrors instead of glass lenses, and today the 36-inch telescope is the second largest of its kind, the largest being the 40-inch telescope at Yerkes Bay, Wisconsin. Allow an hour to get there from San Jose and at least an hour or so to look around. Anytime is a great time to visit, but it's nicest on a clear day and especially fun if you get tickets to one of the summer concerts. Use their webcam to see it now. Where is the Lick Observatory? The Lick Observatory is located on Mount Hamilton, east of the city of San Jose, accessible via Mount Hamilton Road. The road is good, but it was designed for horses and wagons and is narrow and winding. In winter, rain in the valley can turn into snow on Mount Hamilton, and the road may close until it melts. Check conditions online before you go (enter Highway Number 130) or call The Lick Observatory Gift Shop at 408-274-5061. Mount Wilson, outside Los Angeles is home to a 60-inch telescope which was the largest in the world when it was completed in 1908. Near San Diego, you can visit Mount Palomar whose 200-inch Hale Telescope built in 1948 is still among the largest in the world. In northern California, the Hat Creek Radio Observatory near Mount Lassen whose Allen Telescope Array is a joint effort by the SETI Institute (Search for Extra Terrestrial Intelligence) and SRI International. Or if you're craving computer technology, visit San Jose's Computer History Museum.